Sybillina’s parents died when she was tiny and as soon as she was old enough to be of use to anyone, the neighbors, who had taken her in at the time she was orphaned, put her out to work. She must have been very young when she started to work, because at the age of 12, when she became blind and could not work any more, she already had several years of work behind her. The cause of her blindness is unknown, but the child was left doubly destitute with the loss of her sight. The local chapter of the Dominican tertiary sisters took compassion on the child and brought her home to live with them. After a little while of experiencing their kind help, she wanted to join them. They accepted her, young though she was, more out of pity than in any hope of her being able to carry on their busy and varied apostolate. They were soon agreeably surprised to find out how much she could do. She learned to chant the Office quickly and sweetly, and to absorb their teaching about mental prayer as though she had been born for it. She imposed great obligations of prayer on herself, since she could not help them in other ways. Her greatest devotion was to Saint Dominic, and it was to him she addressed herself when she finally became convinced that she simply must have her sight back so that she could help the sisters with their work. Praying earnestly for this intention, Sybillina waited for his feast day. Then, she was certain, he would cure her. Matins came and went with no miracle; little hours, Vespers–and she was still blind. With a sinking heart, Sybillina knelt before Saint Dominic’s statue and begged him to help her. Kneeling there, she was rapt in ecstasy, and she saw him come out of the darkness and take her by the hand. Sybillina, the eager child, was replaced by a mature and thoughtful Sybillina who knew that there would be no cure for her, that she must work her way to heaven through the darkness. She decided to become a anchorite, and obtained the necessary permission. In 1302, at the age of 15, she was sealed into a tiny cell next to the Dominican church at Pavia. At first she had a companion, but her fellow recluse soon gave up the life. Sybillina remained, now alone, as well as blind. The first seven years were the worst, she later admitted. The cold was intense, and she never permitted herself a fire. The church, of course, was not heated, and she wore the same clothes winter and summer. In the winter there was only one way to keep from freezing–keep moving–so she genuflected, and gave herself the discipline. She slept on a board and ate practically nothing. To the tiny window, that was her only communication with the outside world, came the troubled and the sinful and the sick, all begging for her help. She prayed for all of them, and worked many miracles in the lives of the people of Pavia. One of the more amusing requests came from a woman who was terrified of the dark. Sybillina was praying for her when she saw her in a vision, and observed that the woman–who thought she was hearing things–put on a fur hood to shut out the noise. The next day the woman came to see her, and Sybillina laughed gaily. “You were really scared last night, weren’t you?” she asked. “I laughed when I saw you pull that hood over your ears.” The legend reports that the woman was never frightened again. 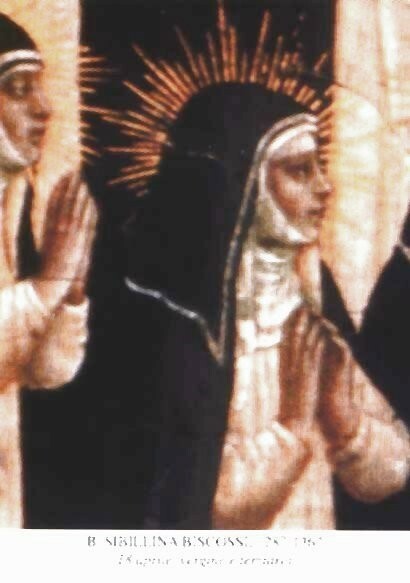 Sybillina had a lively sense of the Real Presence and a deep devotion to the Blessed Sacrament. One day a priest was going past her window with Viaticum for the sick; she knew that the host was not consecrated, and told him so. He investigated, and found he had indeed taken a host from the wrong container. Sybillina lived as a recluse for 67 years. She followed all the Masses and Offices in the church, spending what few spare minutes she had working with her hands to earn a few alms for the poor (Attwater2, Benedictines, Dorcy).